BoardStat was designed with community boards for community boards. BoardStat is a highly interactive tool for community boards that empowers users to discover issues and trends within their district’s boundaries. 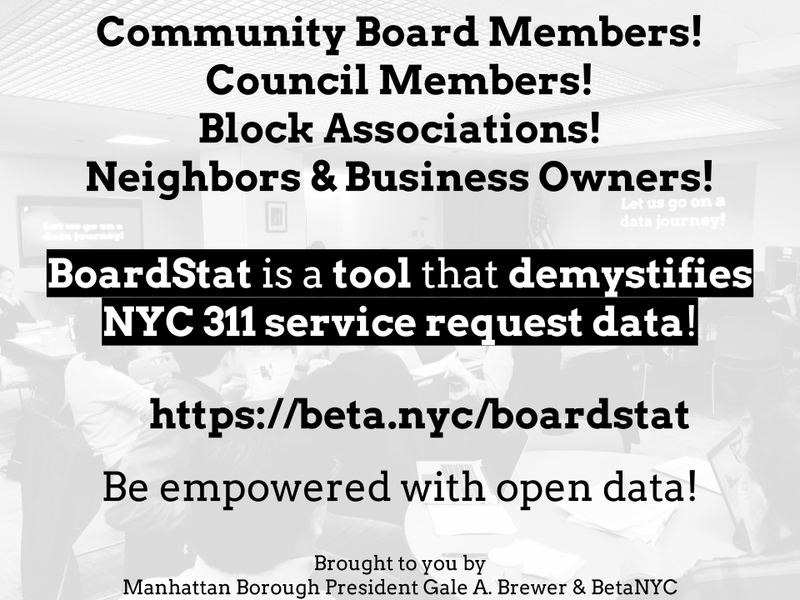 BoardStat empowers board staff and members to gain timely insights into NYC 311 data, and is furthering the Manhattan Borough President Gale A. Brewers’ long standing goal of making government transparent, reactive, and moving beyond open data access to meaningful use. In collaboration with Manhattan’s community board district managers, board members, CUNY Service Corps, Microsoft Civic, and BetaNYC, we have developed a number of data dashboards that to provide a variety of summaries, graphs, and maps of NYC 311 service request data. This tool pulls directly from NYC’s open data portal and turns the city’s open data into a decision making tool. Exploring quality of life issues by examining construction before or after hours. Examine 311 service requests around State Liquor Authority renewal application. Exploring landlord / tenant issues with Heat / Hot Water service requests. Examine health & safety service requests over time. “We passed a first-in-the-nation Open Data Law and we’ve published more than 1,500 data sets with 750 million rows of data, but it’s not enough – the data doesn’t just need to be public, it needs to be usable,” said Manhattan Borough President Gale A. Brewer. Use this png flyer to tell your friends about BoardStat! Our collaborators at BetaNYC are constantly working on improving open data educational materials. Help them improve their training materials by emailing boardstat@manhattanbp.nyc.gov or attend one of their in-person trainings. 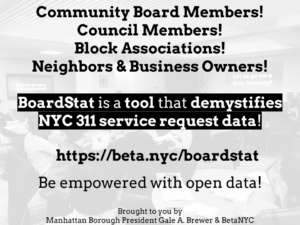 BoardStat is a tool that demystifies NYC 311 service request data.